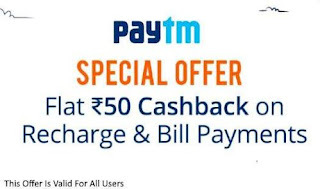 Paytm – Get Rs 50 Cashback on Rs 100 Recharge (New Number). Paytm is back again with awesome deal for those who haven’t recharge their Number with Paytm Yet. 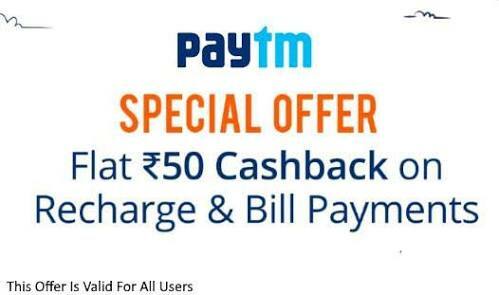 Paytm is giving Flat Rs 50 Cashback on Rs 100 Recharge. So Hurry up and avail this Offer Now !! 3) Initiate a Mobile recharge, Landline, Data card, DTH recharge, Electricity, Financial Services, Metro, Gas, Education, Water & Tolls transactions. (Make Sure Your Number has not been Recharged on Paytm before).